Regular breakfast is one of my resolutions for 2017, because I used to skip breakfast regularly. Are you one of those people? Occasionally, I’d grab a piece of fruit to go with my tea, but usually I’d just push through until lunchtime. Now that I’ve got a baby who loves breakfast, we’ve fallen into a breakfast routine. 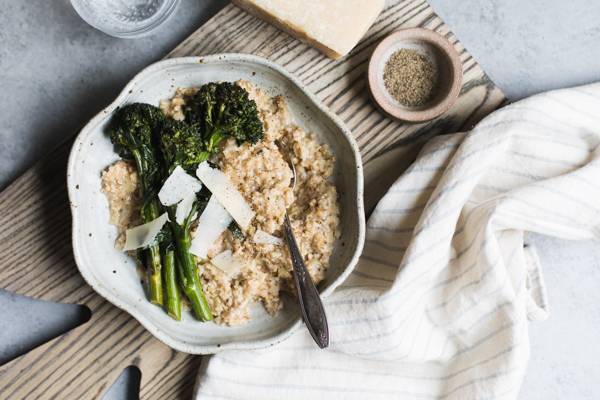 This parmesan leek savory oatmeal topped with broccolini is making the rounds in our kitchen right now. Every morning, we sit facing each other across our big kitchen island, enjoying our respective breakfasts (or making a mess of it on the table, as 11-month-olds do). For as long as she could eat, the babe has been eating some variation of spiced oatmeal and bananas for her morning meal, but as her taste buds become more adventurous, I’m always looking for more interesting breakfast dishes we’ll both enjoy—I would rather avoid making two separate breakfasts! Savory oatmeal fits the bill. In fact, I’m pretty sure the babe was more enthusiastic about this parmesan leek savory oatmeal than her normal banana and oatmeal combo. I don’t blame her. 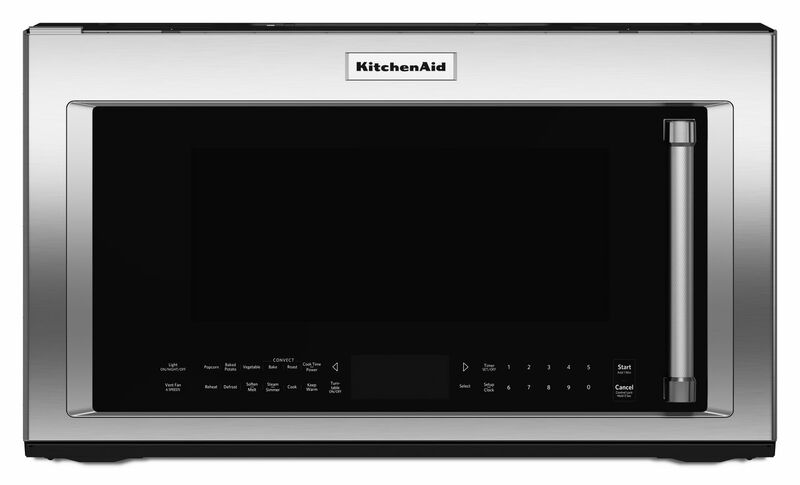 The best part is that I can unwind the night before while making a double batch on the cooktop of my KitchenAid® Gas Convection Slide-In Range and heat it up quickly in my KitchenAid® Convection Microwave using the reheat function for our breakfast the next day! The 5 burners on the cooktop of my Gas Convection Slide-In Range allow me to cook multiple things at once without the pans crowding each other! The burners have a range of cooking power from 5,000 to 19,000 BTU so I can easily simmer the oatmeal while sizzling the broccolini. If you’re a bit messy like I am, the stainless steel top with just two grates to lift makes it easy to wipe up any spills along the way. Savory oatmeal bridges the gap between breakfast and lunch, filling a void in brunch menus everywhere. 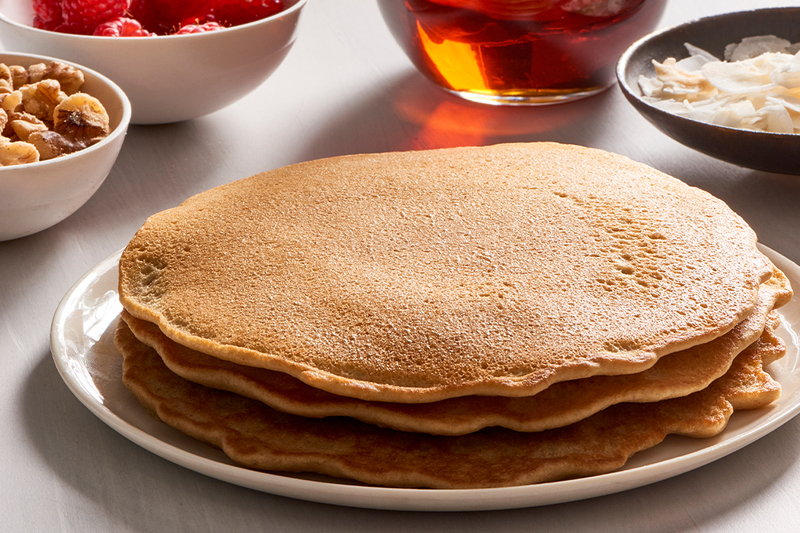 I’ve never been a huge fan of typical American breakfast offerings—eggs, cereal, etc. In fact, I’ll always order from the lunch part of a brunch menu. Savory oatmeal offers something unique—it takes a comforting dish and swaps out its traditionally sweet toppings with vegetables and cheese for a breakfast option with ultimate umami. Flavor aside, vegetable-topped oatmeal is healthy and has enough sticking power to help you start your day off on the right foot. This parmesan leek savory oatmeal isn’t just reserved for breakfast though. Cooked much like risotto, oatmeal replaces rice as an alternative grain that’s packed with fiber, protein, and plenty of nutrients. 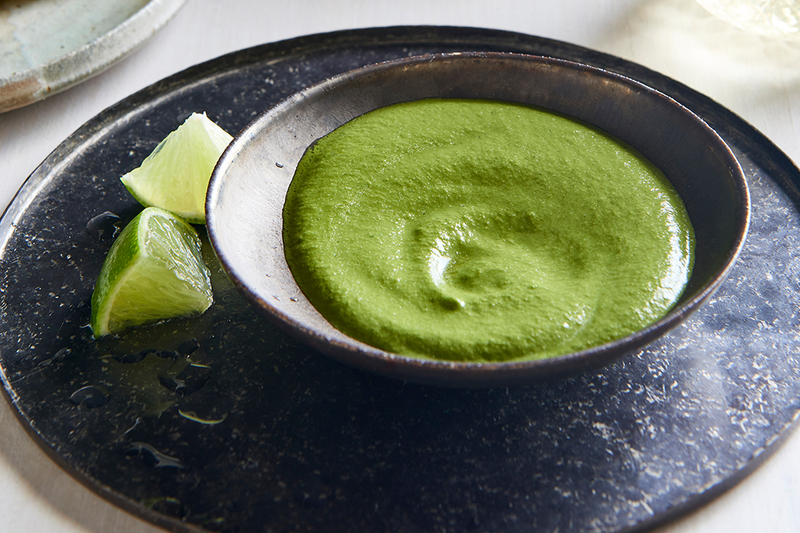 Sometimes we even serve it alongside a rotisserie chicken as a side dish that has a totally unique flavor profile. To make this parmesan leek savory oatmeal, melt 1 tablespoon of butter and sauté chopped leeks and shallots in the 10” skillet from the KitchenAid® Tri-Ply Copper 10-Piece Set over medium heat on the cooktop of the Gas Convection Slide-In Range until soft and starting to brown, for about 3-4 minutes. Pour in 2/3 cup steel cut oats and 1 2/3 cups water and bring it to boil. Reduce heat to a simmer and cook, stirring, until the water is absorbed and oatmeal is cooked through, 15-20 minutes. Meanwhile, melt another tablespoon of butter in the 8” skillet from the Tri-Ply Copper 10-Piece Set over medium heat on another burner of the cooktop of the Gas Convection Slide-In Range. 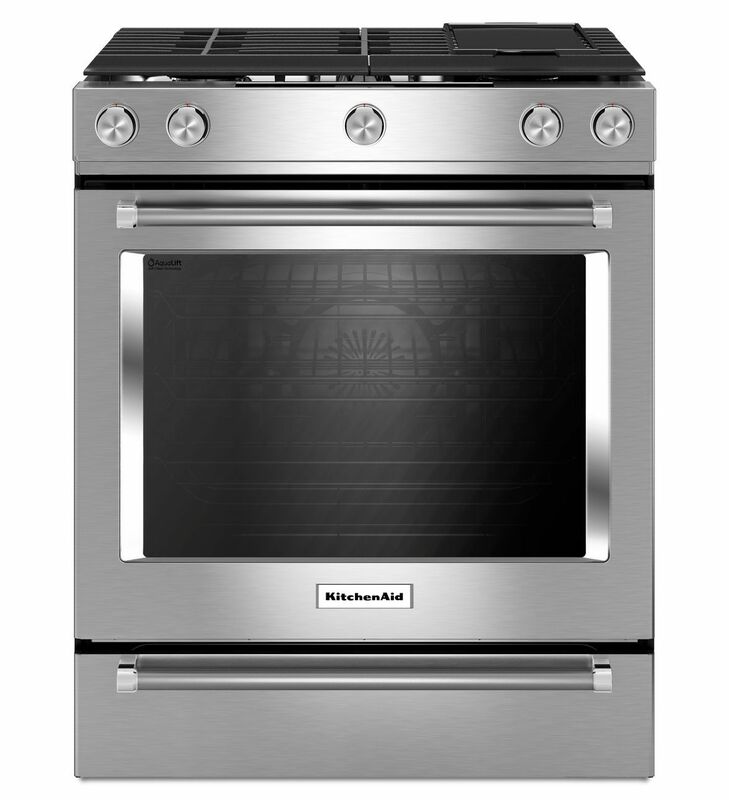 A major feature of this cooktop is the 5-burners that allow you to cook multiple things all at one time without the pans crowding each other! Add the broccolini and garlic, cooking until the broccolini begins to brown, 2-3 minutes. Flip and cook until the other side browns, another 2-3 minutes. Add 1-2 tablespoons of water and cook, covered, over medium-low heat for 2-3 minutes. Repeat this last step until the broccolini is cooked through. When the water is absorbed and the oatmeal is cooked to your desired texture (I like mine soft, but with a little bite), stir in the grated parmesan cheese. 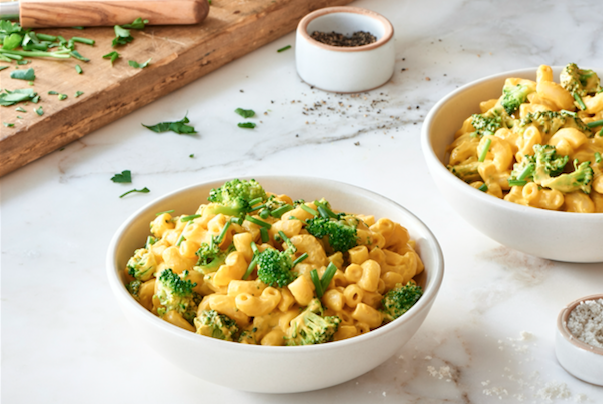 Serve topped with broccolini, shaved parmesan, and freshly ground pepper. I plan to spend 2017 creating variations on this basic recipe to mix up our breakfast, lunch, and dinner menus, changing the vegetables and spices with the seasons. I treat savory oatmeal like a blank canvas similar to a tahini quinoa bowl—I keep my favorite roasted vegetables on hand and just throw various combinations together depending on what I’m craving. For another seasonal option for January, try roasted winter squash or sweet potatoes! Go crazy and throw a fried egg on top! Share your take on this Parmesan Leak Savory Oatmeal on Instagram using #MadeWithKitchenAid for a chance to be featured. 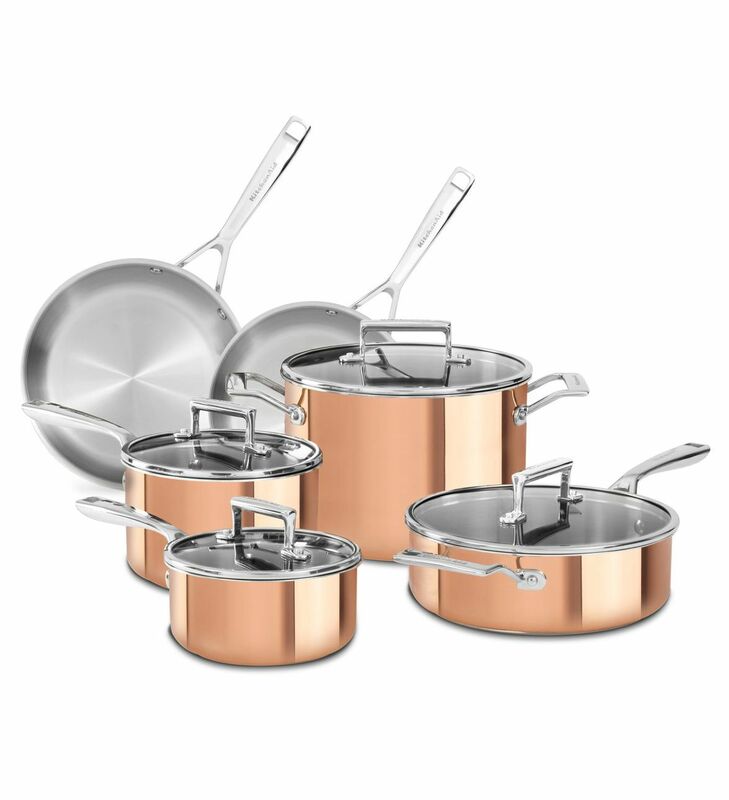 Melt 1 tablespoon butter in a 10” skillet from the KitchenAid® Tri-Ply Copper 10-Piece Set over medium heat on the cooktop of the KitchenAid® Gas Convection Slide-In Range. Add the leek and shallot and cook, stirring, until it softens and begins to brown, 3-4 minutes. Add the oats and water and stir to combine. Bring to a boil and reduce heat to a simmer. Continue cooking, stirring occasionally, until the oats are cooked through to desired consistency, 15-20 minutes. Meanwhile, melt the remaining butter in the 8” skillet from the Tri-Ply Copper 10-Piece Set over medium heat on the cooktop of the Gas Convection Slide-In Range. Add the broccolini and garlic and cook until the broccolini begins to brown, 2-3 minutes. Use tongs to flip broccolini and cook for an additional 2-3 minutes until it begins to brown. Add 1-2 tablespoons of water and cover. Reduce heat to medium-low and cook for 2-3 minutes. Check for doneness with a knife. If it needs to cook longer (depending on the size of your broccolini), repeat the last step, adding water and cooking covered until done. Fold in the grated parmesan cheese when the oats are done cooking. Taste and add salt and pepper as desired. Top with cooked broccolini, shaved parmesan, and freshly ground pepper. Serve immediately.